Looking for some eco-friendly, non-toxic toys for your tot? With Earth Day right around the corner, we couldn't have asked for a better time to check out Etsy's selection of "green" toys for kids. Read further for our top 10 picks that your eco-conscious little one will love this spring. Happy 41st Earth Day! 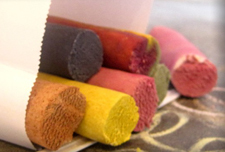 We can't get enough of this beautiful sidewalk chalk featured in the Wee Can Too Etsy shop! Priced at $10 for a set of five colors, this chalk is 100 percent vegan, toxin-free and made with all organic fruit and vegetable powders. Though we wouldn't recommend purposely eating this chalk, you'll feel much safer knowing that you've got nothing to worry about if it happens to end up in your child's mouth. (It happens!) Also be sure to check out Wee Can Too's vegan fingerpaint ($35) and veggie crayons ($10). Too cool! The Maria Palito Etsy shop features these eco-friendly hand puppets for kids and they couldn't be cuter! Available as a set for $12.99, these lovely critter puppets are non-toxic, allergen-free and made with felt from recycled post-costumer plastic bottles. That's impressive! 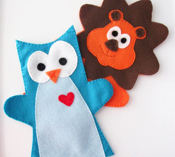 Check out the rest of Maria Palito's selection for plenty more hand-sewn puppets in different colors, various animals and specific sizes made for small hands. Also to consider -- this shop is featuring a 10 percent discount on orders placed between April 4-30. Doesn't get much better than that! 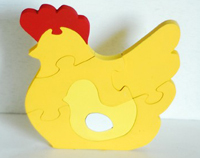 We love this chicken, chick and egg wooden puzzle offered in the Diva Poppins Etsy shop. Priced at $7.99, this seven-piece eco-friendly puzzle comes complete with non-toxic, bright acrylic paints and is sealed to be safe for children. Also not to be missed -- The Diva Poppins shop as well offers personalized name puzzles ($12.99-24.99) and a gorgeous, colorful parrot puzzle that actually comes with its own fitted, hanging perch ($34.99)! You gotta see it to believe it. The Mama May I Etsy shop has some of the coolest eco-friendly, creative toys on Etsy and these flutter fly streamers are no exception! 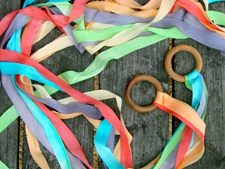 Priced at $27, this whimsical toy features twelve hand-dyed, rainbow silk streamers, handle hoops that are sealed with organic beeswax and jojoba oil and a muslin bag for storage. Great for the environment and also for plenty of imaginative fun! Be sure to check out the rest of Mama May I's awesome selection -- you won't regret it! We as well highlighted her zoo edition match game in our 2010 Etsy holiday gift guide. Looking for green baby gifts? 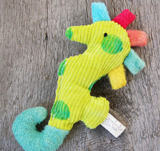 Visit the Ecoleeko Etsy shop to find fabulous all-natural baby rattles, such as this cuddly sea horse. You'll find a mouse, owl, bluebird and even an alligator -- all priced at $16. Made with hand-dyed organic cotton, hemp corduroy and bamboo fleece, these rattles even go as far as to offer bamboo-blended yarn and organic cotton thread. The bodies are filled with a natural Kapok fiber and feature buckwheat hulls for a crunching sound and a jingle bell that is softly wrapped in jersey cotton. They have really thought of it all! Visit the Ecoleeko shop for equally impressive earth-friendly plush dolls, finger puppets, baby blankets and much more. 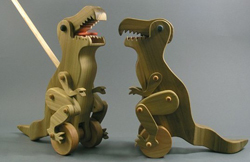 The Arks and Animals Etsy shop offers up some great wooden fun, including these T. Rex push toys. Priced at $49.75 a piece, these wooden dino buddies have legs and arms that move as they are pushed and mouths that open and close to show off a big red tongue. Super fun! Arks and Animals also features wooden piggy banks, various animal play sets and neat puzzles. And the best part? All of the toys are made with all-natural woods and non-toxic paints and finishes. We can't get enough of the Peachy and Keen Etsy shop's therapeutic fun dough! Priced at $16 for a stackable set of four colors, the eco-friendly dough is 100 percent all-natural and gluten-free with ingredients straight out of the kitchen. It's even biodegradable! 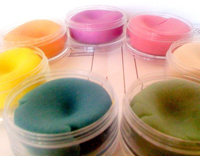 Each dough offers a delicious scent including mint, eucalyptus, lemon, rose, lavender and vanilla -- with beautiful, bright colors to boot! Head over to the Peachy and Keen shop to see all of the available dough sets. Especially for ParentMap readers: Take 10 percent off your fun dough order by typing in "SAVEDOUGH" at checkout! The Sarah Bain Etsy shop features a variety of one-of-a-kind, eco-friendly memory match games, such as these super cute elephants! Priced at $14, each memory match game includes 22 squares -- and 11 matches -- with elephant silhouettes upcycled from old magazine images. The memory pieces are finished with a water-based, non-toxic seal and the game comes complete with a handmade muslin bag. Sarah Bain also offers matching games with whales, bunnies (great for Easter! ), birdies, butterflies and more. We love this felt tea party set featured in the Pixiekids Toys, LLC Etsy shop! Available in pink or blue and priced at $39.95, this tea set is handmade with Eco-felt (felt made from recycled plastic bottles) and comes with 11 different pieces, including a silver tray and four sugar cookies that actually smell like real sugar cookies! Also not to be missed -- Pixiekids Toys, LLC has some amazing felt food sets in their shop. We recommend checking out the cinnamon roll bakery set, the breakfast set or the grocery basket set; though you can't really go wrong with any of them! Got a teething toddler in the house? Consider snapping up an organic hardwood teether -- such as this cute snail -- in the Eco Tot Toys Etsy Shop! Available for $13 a piece, these all-natural, organic hardwood teething toys are made with reclaimed maple and sanded down and coated with safe beeswax so that mama won't have to worry. Perfect for the tots that are into putting everything in their mouths, the Eco Tot Toys' teethers come in a variety of fun animals with middle hole for small hands to grip easily.